Lick envisioned a global interconnected computer network through which everyone could access data and programs from anywhere. This isn’t only the first recorded vision for what would later become the Internet, it’s also the first recorded description of computers as not only calculating machines, but as joyful tools of expression, inspiring creativity, and opening a gateway to a new age of globally accessible information. 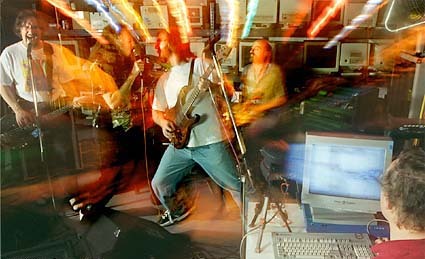 The Web’s 1st video was Streaming-Screaming-ROCK! "SEVERE TIRE DAMAGE HOUSE BAND OF THE INTERNET"
This was mainly done as a proof of concept “…that technology can be both loud and annoying“. Then in the beginning of 1996, Microsoft developed the ActiveMovie media player, that allowed streaming media and included a proprietary streaming format. In 1997 RealPlayer released their own streaming application. Despite the technologies availability the predominant 56k dial-up connection speeds of the time made video delivery still too slow for the availability of players to revolutionize the industry. In 1999 Apple debuted its own streaming media format – Quicktime 4. It was later adopted on websites along with RealPlayer and Windows Media streaming formats. The lack of a predominant format required users to download all the respective applications for streaming to their computer – an untidy and wasteful situation that was mostly rectified starting in 2002 with the mass adoption of Adobe Flash as user’s streaming technology of choice. “…US political campaigns often begets online trends and with the 2004 presidential election, Howard Dean’s campaign took the online world by storm not just by chatter, but because micro donations became significant and challenged traditional means of hitting up only the established elite. Andrew is probably one of he best qualified people to make this type of statement with any validation. In October that year he established Rocketboom, “the longest running online video show to date” . He’s also widely recognized as being one of the world’s first vloggers. Valentine’s day of 2005 was the day chosen to establish the company that has since become synonymous with online video. Indeed some resources count the history of Online Video from this point, ignoring everything that preceded it. In case you still need me to spell it out, Valentine 2005 was Youtube‘s birthday, and in April of the same year their first videos came online. Remember this? What the Hell is the Internet Anyway?